Samuel Franklin Cody had to be one of the most colorful and entertaining aviation pioneers. He was born in Birdville, Texas in 1861 into the prairie life of a cowboy. His boyhood is pure American Wild West; catching and training wild horses, becoming a highly skilled buffalo hunter, rifle and lasso expert, and gold prospector in the Yukon. After touring America for a few years in a Wild West show billed as ‘Captain Cody, King of the Cowboys’ he decided to settle in England in 1890 eventually becoming a naturalized English citizen. Cody became a showman and drafted his immediate family into forming a touring company. During these shows Cody’s considerable skill in riding, lassoing, and shooting were demonstrated in music halls. His persona of extravagant dress was adopted from his friend ‘Buffalo Bill’. In addition to the shoulder length hair, beard, mustache, Stetson, fringed buckskins and cowboy boots, there was a close physical resemblance that helped Cody to purposely blur the line between himself and Buffalo Bill. In 1898 Cody produced a show called The Klondyke Nugget that was based on his life during the gold prospecting years in the Yukon. The gory melodrama was a huge financial success as it highlighted the individual talents of the various Cody’s. Leon Cody, (Samuel’s son) had become very interested as well as proficient in kite flying and during this time the father and son team began competing with kites that became increasingly larger in size. Cody himself was said to have learned about kites from a Chinese cook back on the Cody ranch in Texas. By 1900 the tides had turned and Cody’s passion for his hobby of kiteflying had surpassed his previous interests of show business. Fortunately the Klondyke Nugget continued to play to packed houses and enabled him financially to experiment with a series of kite configurations. This was apparently very necessary since there was a newspaper account reporting that his first manned air flight using kites in tandem lifted him eighty feet in the air when all of a sudden a gust of wind made the kites dive into some trees. Cody’s ability to hang onto the upper branches of the tree is said to have saved his life. He vowed at this time to redesign the kites. Cody did extensive research on a variety of designs and eventually decided that his ‘bat’ design was the way to go. 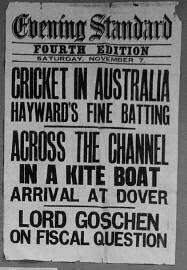 The bats, as they were called were double celled Hargrave box kites with wings added for additional lift, scalloped edges on the wings for stability, and a topsail, which he patented in 1901. With this kite Cody developed an amazing man-lifting system. 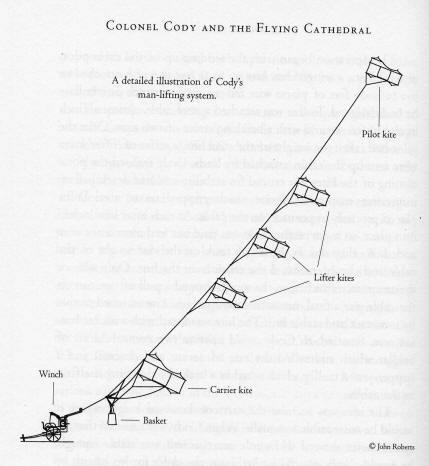 Cody’s man-lifting system started with a small steadying pilot kite, then was followed by a team of lifter kites, with the number of lifter kites depending on the wind conditions. These lifter kites were attached to the main flying cable by two towing rings, one at the head of the kite, and one at the towing point of a four legged bridle. When released, the kite would go up the flying line, which had a number of cone shaped stops at predetermined points along the flying line. The conical stops became progressively larger as they approached the top of the line, corresponding to the increasing size of the tow rings. So, as the first lifter kite traveled up the line, its large towing ring would pass over the smaller cones stopping its free travel as it reached its predetermined mooring point. Then the next lifter kite would be released with a little smaller towing ring until it stopped against the next to last one. After a satisfactory number of lifter kites were secured to the cable, the carrier kite was attached to a trolley, the wheels of which ran along the top of the cable. From this trolley was suspended the wicker basket that carried the passenger aloft. The carrier kite was released and it traveled up the cable towards the lower lifter kite. The brave passenger could control the ascent and descent by working a complicated system of lines and brakes. The lines gave the kite greater or lesser lift by adjusting the inclination of the kite to the horizontal. Cody was so thrilled with his invention that he demonstrated it for the British military. It was proposed that in military applications the passenger could be outfitted with a; telescope, telephone, camera, and firearm and lifted to an altitude of 3,500 feet. The British military authority was not at all interested Cody’s initial approaches. It has been said that in spite of Cody’s ornate fashion sense, and his claim to be illiterate, he was a man of a great deal of intelligence. He had an extremely practical outlook that was bolstered by what seemed to be incredible amount of courage, strength and determination. Even with all this going for him, the first impression that Cody presented to people made them reluctant to take his aeronautical career very seriously. Initially his considerable achievements in the air…considered by some to be the maker of the first practical flying machine… were perceived to be merely an extension of his show-business promotion. However the British military authorities were so impressed with his ability as a marksman they offered him a position as a shooting instructor at Aldershot. Cody declined the offer. Cody was undaunted. His perseverance to his kite plans were firmly intact, so Samuel Franklin Cody did what he did best…promote himself and his interest with passion. 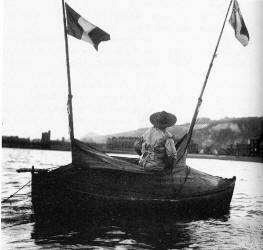 To publicize the traction potential of his system Cody successfully crossed the English Channel using a collapsible boat powered by kites, it was November of 1903 and it took thirteen hours. Cody’s boat was a modification of a collapsible dinghy that was 13 feet long, a deck covered with cork for maximum buoyancy, and a well ballasted keel. In order to keep the line taut, a drogue anchor was towed behind the boat to provide resistance to the pull of kites. Prior to this successful trip which was made from Calais to Dover, several un-successful attempts were made from Dover, all of which were met with adverse wind conditions. These crossings resulted in many public demonstrations of the invention and created positive publicity. During this time Mrs. Cody also flew in her husbands man carrying kites to show her confidence in his invention. All this had the desired effect and the military finally became interested in his work with kites. The British Admiralty Commission invited Cody to demonstrate his man hauling kites on Whale Island in Portsmouth at the end of 1903. The first one to go up was Cody’s son Vivian who went up two hundred feet to take photographs. He was followed by Cody himself who went up for hundred feet. 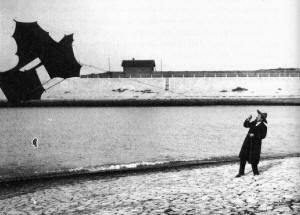 Then Leon went up eight hundred feet on a kite and took photos of the warships in the harbor. It has been said that for all intents and purposes this was the birth of the Royal Air Force. Despite the war offices initial reluctance to associate with Cody, the following year he was engaged by the war office to experiment with kites for artillery observation and photo reconnaissance. The Admiralty put warships at Cody’s disposal and extensive kite trials were carried out on both land and water during 1904 and 1905. What could certainly be a record height of 2,600 feet ( 792.6 m ) was attained during these trials on cable that was 4000 feet ( 1219 m ) long. At long last, the War Office adopted Cody’s system in 1906 for Army observation. It was then, that S.F. Cody was given what was perhaps the first official ‘title’ in Western Kite History. Cody was granted Officer status with the post of Chief Kite Instructor to the British Army at Farnborough, where his duties included the design and manufacture of kites, as well as giving instruction in the operation of these contraptions. The salary Cody received for this position was one thousand pounds annually plus free fodder for his (now famous) white stallion, commonly known to be his favorite mode of transportation. During the very early 1900’s there were numerous kite competitions held throughout Europe with the most prestigious being organized by the Aeronautical Society of Great Britain. It was common to see Cody, his son Leon, and Baden-Powell, among others, frequently listed on the competitors list. In June of 1903 Cody took second place in the International Kite Trials at Worthing Down which earned him membership in the Aeronautical Society, later becoming the Royal Aeronautical Society. Just as Cody’s persona was large and memorable, so too was his influence. His talent at promotion brought aeronautical pioneers and their experiments to the forefront by continually making news. One of the consequences of Cody’s experiments was the 1909 competition held by Charles Dollfus of France, to locate for the French Military Authorities the most successful man-lifting technique available. Using a system very similar to Cody’s, Captain Madiot won first prize, although he later died during a flying accident before his project could be brought to fruition. In the aftermath the French army chose Captain Saconney’s system, which also bore a resemblance to Cody’s original set up. Kites for use by the military were not the only direction Cody took with his kites. Cody was made a Fellow of the Royal Meteorological Society for his contribution to weather research. On one particular occasion Cody lifted instruments to the (then) record altitude of 14,000 feet ( 4,268m ). Cody gave a demonstration of a modern day weather instrument called the meteorograph that had been developed by the Meteorological Office to register: height, temperature, humidity, and wind velocity, during a kite display at Cobham Common in 1907. Cody’s curiosity, courage and enthusiasm inevitably led him to experiment with powered flight, and in October of 1908 he became the first man to build and fly an aeroplane in Britain. Five years later on August 7, 1913 Cody and his passenger were killed when flying in Cody’s most recent development the Waterplane.